So what is a box squat? You might have seen this variation of squat in your local gym or facility – a squat where the athlete or client descends until their glutes and hips reach a stable surface (generally a bench, jerk block or plyometric box), at which point they may pause depending on the variation, before ascending and completing the movement. Simple enough, right? While it may appear that is all there is to it, there are important factors to consider when both programming a box squat, and actually completing the movement. This is simply a traditional squat, with a box (again, just a bench / jerk block / plyometric box) set up behind the athlete or client in a position that they can comfortably squat to at the bottom of the movement. The main use of this variation is to simply provide the athlete or client with a depth marker, so that they know where they should be squatting to. This is particularly handy when depth consistency is an issue (their depth of squat varies significantly, usually shifting between below and above parallel), or when there is a confidence issue reaching the required depth. Having a physical surface that they can squat to not only allows for the athlete or client to hit the desired depth consistently on every rep, it also provides them with a ‘safety net’ of sorts. 1. The athlete or client should not ‘sit’ on the box at the bottom of the movement – instead they should simply stop when they reach the bench / block / box, ensuring they retain tension and continue to hold the load, before ascending and completing the squat movement as per normal. 2. The height of the bench / block / box should be appropriate for the athlete or client. For the majority of people with no mobility or injury restrictions, you should be aiming for below parallel to maximize the benefits of the movement. Have the athlete or client squat to the surface without any load (i.e. bodyweight squat) prior to beginning any reps to ensure the height is correct. The same obviously applies if you are specifically restricting depth due to a mobility or injury issue. This is the variation we more commonly use at APL, and is one of the core movements we program for a lot of our athletes and clients. Made popular in particular by Westside Barbell, this variation of the squat aims to specifically load the athlete or client’s posterior chain (think glutes and hamstrings in particular) and eliminate or minimize any forward knee slide and in turn anterior chain loading. It retains the benefits of the squat to box – consistent depth in squatting, as well as incorporating a ‘safety net’ for less confident athletes or clients – while also addressing those people with posterior chain weak-points. 1. Set the athlete or client up in a wider than normal squat stance. A stance width similar to your sumo deadlift set-up is generally a good guide, but adjust accordingly based on hip mobility. 2. Ensure the athlete or client follows the normal squat cue to generate external rotation through their hips (screwing their feet into the ground), bracing through their core, and breathing in prior to beginning the movement to increase inter-abdominal pressure and tightness. 3. Ensure the athlete or client sits their hips back as they begin descending, aiming to maintain vertical shins throughout the movement. You will need to allow for the torso to shift into a slightly more forward position than normal, however ensure this is a smooth transition – the hips should continue to descend as the torso moves forward, so that the athlete or client does not end up in a good morning position. 4. Similar to the squat to box, ensure the athlete or client does not ‘sit’ at the bottom of the movement – a pause is ideal, however they should retain full tension and continue to hold the load themselves, using the box simply as a physical cue as to when to stop the descent. 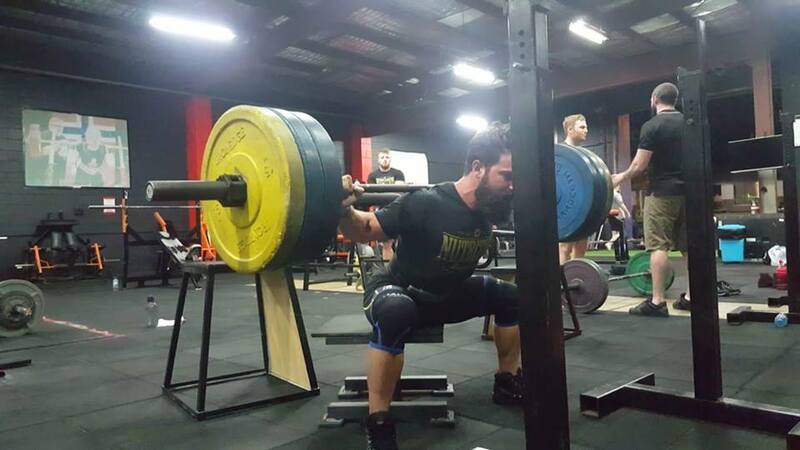 So in a nutshell – if you are simply looking to help an athlete or client struggling with squat depth or confidence, a squat to box might be what you are after. If you are looking to address weak-points in someone’s posterior chain strength (particularly glutes and hamstrings), while also ensuring consistent squat depth, box squats would be more appropriate.